Can a webform list who has already signed up for an event? I would like to use a webform for people to signup for an event - but they need to see who else has signed up as these events need at least one of each gender. The event is a kind of 'first aid' event where you must have both men and women on duty - not just all men or all women. I've used webforms for signing up individuals for events, but not run into this requirement before. You can list the people using CiviCRM Views and add the View to the same page as the webform. Easiest is to put the View into a block, but you can also do this with the Paragraphs module or Panels. Where id=3 is the event ID. To allow users to see a listing of participants, set this field to 'Name' (list names only), 'Name and Email', or 'Name, Status and Register Date'. You will need to set Access Control permissions to include 'view event participants' for any Roles you want to access this listing. Is it possible to allow people to submit their own events to CiviCRM? 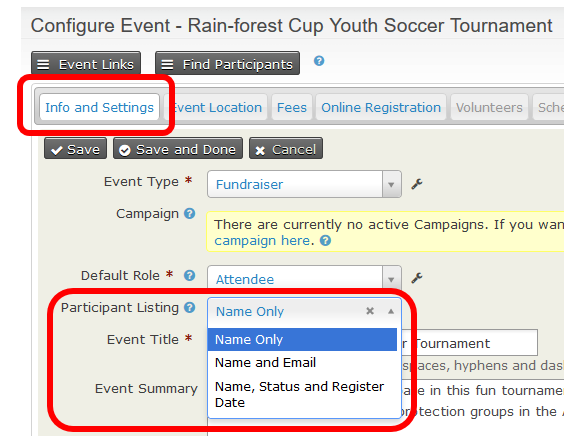 How do I format a webform to register for events so I can fill it out multiple times without cancelling previous registrations?